Of art, science, music, poetry - & Scottish festivities! My half-Scottish heart is taking great delight in being back in Edinburgh for the opening week of the Edinburgh International Book Festival, catching up with friends, publishers and writers in this glorious city (you can see more on Blake Friedmann author events at the Book Festival here). I’m also happy to be reading on Wednesday night at the Fruitmarket Gallery with poets Tom Chivers, Claire Crowther, Rob Mackenzie and Andrew Philip. I’ve read with local poets Rob and Andy at the gallery a few years in a row now, every time a great reminder of what skilled and entertaining writers they are. I’m looking forward to Tom and Claire joining us in their first Fruitmarket appearance. (See more on each poet on the Facebook event page above). The reading kicks off at 8 pm, Wed 19 August, but doors will be open from 7.30 pm, so do take the chance to come and see the wonderful Phyllida Barlow exhibition before the readings start, or just say hello and have a glass of wine. One of the poets’ tasks for Wednesday night is to write a new poem inspired by the work in the exhibition, and I’m very curious to hear what my fellow readers have done with it. They’re all fine poets, and it’s sure to be an interesting night. The gallery, right by Waverley Station, is usually open 11 am to 6 pm daily, but stays open to 7 pm in Festival time, and the exhibition is free, so if you’re in Edinburgh you can catch the exhibition between now and 18 October. And hope to see some friends this Wednesday night. Next month I’ll be at another Scottish festival, the Bloody Scotland crime fiction fest in Stirling , and am excited to stop off at Sheffield on my way back to London to join in the launch celebrations for AB Jackson’s The Wilderness Party (a Poetry Book Society recommendation for Autumn 2015). AB Jackson is one of my favourite UK poets, and I can’t wait to read this collection and thrilled to be doing a short support reading at the Sheffield launch on Monday 14 September, along with Simon Barraclough – whose brilliant new collection Sunspots is also out from Penned in the Margins. You can also see Simon in his Sunspots show on tour in the months ahead. Penned in the Margins publisher Tom Chivers is a busy man right now, with Penned in the Margins author publications, tours and prize shortlistings, but he’ll be reading from his striking collection Dark Islands at the Fruitmarket on Wednesday, as well as new work. Great to catch up with so many authors and publishers at the Book Festival’s opening party last night, including my clients Margie Orford and Pippa Goldschmidt – South African crime writer Margie is on at the Book Festival tomorrow with Ben McPherson (Monday 17 August, 5pm at the Writers’ Retreat, guaranteed to be an intriguing discussion). Margie’s also appearing with Alexandra Sokoloff atBloody Scotland in Stirling on 12 September. And Pippa’s new short story collection The Need for Better Regulation of Outer Space, published by Freight Books, is a real treat for lovers of science, astronomy and short fiction. With Tania Hershman she’s also co-editing an anthology of stories on general relativity I Am Because You Are (also published by Freight Books) and you can hear her on this at the Orkney Science Festival on 6 September and at the Wigtown Book Festival with Marek Kukula, the public astonomer at the Royal Observatory Greenwich, on Sunday 27 September. … & thinking of Scottish festivals, I can’t believe it’s almost a year since a really fun project I was involved in for the Sound Festival’s Skills Biennale 2014, with composer Stephen Montague and the BrewDog brewery in Ellon, Aberdeenshire,. 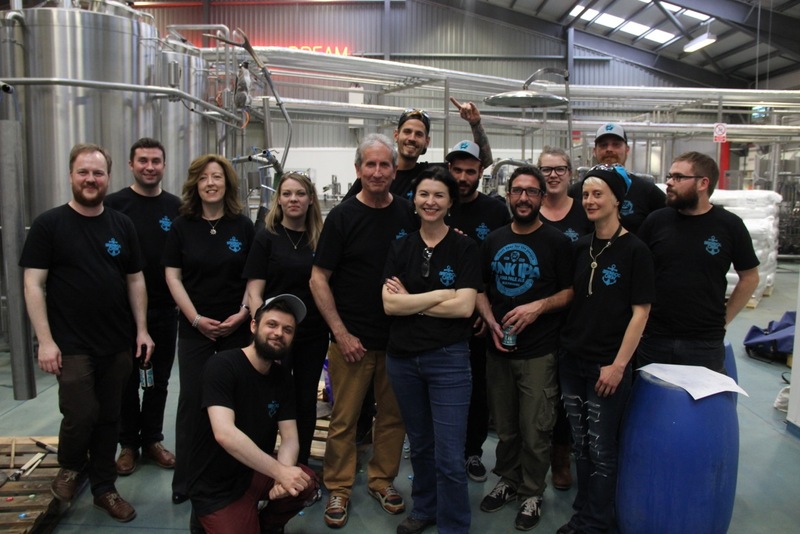 Here’s a piece I wrote about the development and performance of that piece – ‘The BrewDog Howls – Poetry, Percussion and the Art of Collaboration’. You can see some pics here (scroll down a bit) and on the far left in the group pic of our brewery orchestra on performance day you’ll spot Iain Morrison, Enterprise Manager of the Fruitmarket Gallery, who gamely stepped in to read the poem for the piece – so we’re back full circle to the Fruitmarket! A reading featuring some new art-related poems written especially for the event - come see the Phyllida Barlow exhibition and listen to some poems! With Tom Chivers, Isobel Dixon, Rob Mackenzie, Andrew Phillip and Claire Crowther. A lively night at the Fruitmarket in Edinburgh Festival season. I'm thrilled to be joining Simon Barraclough in reading some poems in support of the Sheffield launch of AB Jackson's new collection, The Wilderness Party, out in September from Bloodaxe. The Wilderness Party is a Poetry Book Society Recommendation for Autumn 2015. 7:00 pm, The Fat Cat, 23 Alma Street, S3 8SA Sheffield. Readings will take place between 8 and 9 pm. pit mirk, pick mirk, part mirk, heart mirk. the fundamental particle of night. gather in the corner of his shed. could be his service to us all. Friday at the Fruitmarket: for more information, click here. of the world we love and suffer in. of fortune flicks, scales flex. Fruitmarket Gallery, Friday 15 August 2014, 8 pm. Every year I look forward to returning to Edinburgh at Festival time – because I’m half-Scottish and studied at Edinburgh University, because I love the Book Festival and other festivities there, and because it’s one of the truly splendid cities of the world. And for the last few years the Fruitmarket Gallery has given added reason for delight, providing the setting for a fine evening of poetry, whatever the festival weather. Hosted by the Fruitmarket’s inimitable Iain Morrison and local host poets Andrew Philip and Rob Mackenzie, the night alone’s been worth the trip north. I’m very happy this year to be joining Andy and Rob again, along with Simon Barraclough, Chrissy Williams and AB Jackson, and to be hosting here, virtually, a small introduction to their brilliant work. Here's our second Edinburgh host, Andrew Philip, to round things off. Andrew Philip was born in Aberdeen, and grew up in a former mining village near Falkirk. He studied Linguistics at the University of Edinburgh. He published two poetry pamphlets with HappenStance Press - Tonguefire (2005) and Andrew Philip: A Sampler (2008). His first full collection, The Ambulance Box, was published by Salt in 2009; it was shortlisted for the Seamus Heaney Centre Prize for Poetry and the Scottish Mortgage Investment Trust First Book Award in 2010. The North End of the Possible was published in 2012 by Salt Publishing. He lives in Linlithgow. More details on the event here. Isobel Dixon's latest collections are A Fold in the Map and The Tempest Prognosticator. She co-wrote and performed in The Debris Field, about the sinking of RMS Titanic, and is working on a project with Scottish artist Doug Robertson, responding to DH Lawrence's Birds, Beasts & Flowers. She has a new collection forthcoming from Nine Arches in 2015 and a pamphlet due from Mariscat in 2016. She completed her post-graduate study in Edinburgh and no year is quite complete without a climb up Arthur's Seat. Every year I look forward to returning to Edinburgh at Festival time – because I’m half-Scottish and studied at Edinburgh University, because I love the Book Festival and other festivities there, and because it’s one of the world’s truly splendid cities. And for the last few years the Fruitmarket Gallery has given added reason for delight, providing the setting for a fine evening of poetry, whatever the festival weather. Hosted by the Fruitmarket’s inimitable Iain Morrison and local poets Andrew Philip and Rob Mackenzie, the night alone’s been worth the trip north. Next in line is Simon Barraclough, author of the Forward-finalist debut, Los Alamos Mon Amour (Salt, 2008), Bonjour Tetris (Penned in the Margins, 2010) and Neptune Blue (Salt, 2011). He is the editor ofPsycho Poetica (Sidekick Books, 2012) and co-author of The Debris Field (Sidekick Books, 2013). He is currently poet in residence at the Mullard Space Science Laboratory. the crouching continent where Paris piggybacks. to finish on us kissing in the festive, fireworky air. saw you junketing in hotel rooms out east. to be pixellated, cut and pasted. our phantom fingers passed clean through. And we’re very happy to have A.B. Jackson returning to Scotland from Sheffield for this reading. A.B. Jackson won the Forward prize for best collection in 2003 with Fire Stations (Anvil), and published a limited edition pamphlet, Apocrypha, with Donut Press in 2011. In 2010 he won first prize in the Edwin Morgan International Poetry Competition, and is currently studying for a PhD at Sheffield Hallam University. breed and how they disagree with Dragons. How they make sport in a kind of Morrish dance. The elephant who wrote Greeke and read musicke. a wench in Egypt who sold nosegaies and wickerishe. images of the gods, fine combes, wanton toies. Who march alwaies in troupes. Who snuffe and puffe. Who the troublesome flie haunts. by dashing and sprinkling themselves with water. casting and flinging herbs up toward heaven. See A.B. Jackson’s website here. Chrissy Williams is a writer and freelance editor living in London. She is director of the Free Verse: Poetry Book Fair. She has published four pamphlets. Flying Into the Bear (HappenStance, 2013) was shortlisted for the Michael Marks Awards. The Jam Trap and ANGELA are collaborations with comics artists. Her most recent pamphlet is Epigraphs (if p then q, 2014). and Sisson, which have been rearranged here. Rob A. Mackenzie was born and brought up in Glasgow and lives in Leith. He has published two pamphlets (with HappenStance and Salt) and two full collections (both with Salt), the latest of which,The Good News, was published in April 2013. He is reviews editor of Magma poetry magazine. to talk about how we think the things we’ve thought. like the Prime Minister and his unlikeable sidekick. we need to stick by the manual, even if useless. An interview with translator Ottilie Mulzet on László Krasznahorkai. Sadie Stein on the postcard in the age of e-mail and social media. One of the great love poems. By W.S. Graham, for his wife Nessie Dunsmuir (a little bit of a Scots/Nessie theme today….). The Debris Field Poets’ Reunion Night, St Pancras. Waiting for champagne… From left to right, Simon Barraclough, Chris McCabe, Isobel Dixon. Waiter Mathieu behind the camera.